For Debra Amoroso, a New York City public school teacher for the past ten years, it’s all about instilling a love of science in her students through experiential learning. Her favorite teaching laboratory has always been New York City’s waterways and beaches. 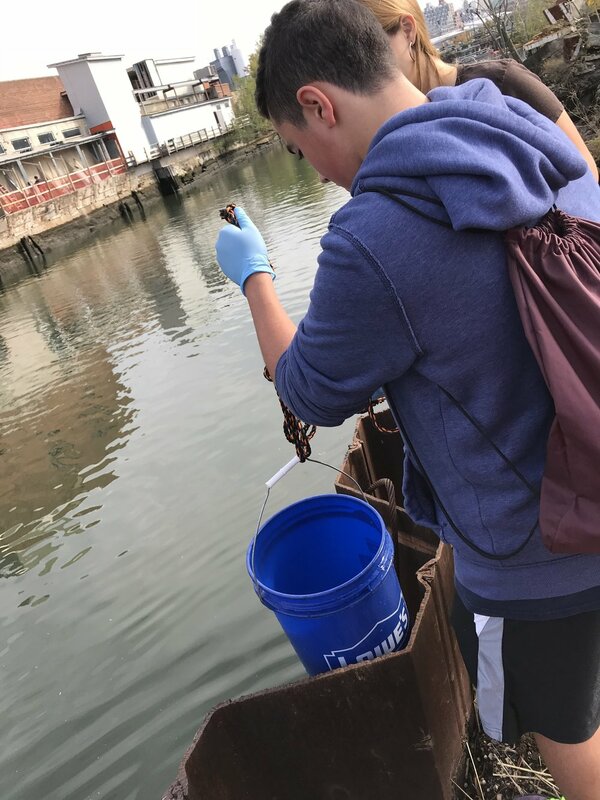 Today, as a teacher at Intermediate School 24 in Great Kills, Amoroso is always finding ways to connect her students with their marine environment. She takes them on field trips to the New York Aquarium and has lugged oyster colonies on public transit from Governors Island to Great Kills for planting as part of the Billion Oyster project. She runs an ongoing citizen science program testing the heavily polluted waters of the Gowanus Canal in Brooklyn. Amoroso connected with Living Breakwaters when her principal forwarded an email about a meeting to be held about the project at New Dorp High School in January 2014. She was immediately enthused. “What an experience it will be, I thought, to go to Living Breakwaters and show my students how this helps to take down some of the wave action hitting our shores,” she relates. “At the meeting they talked about education being a whole part of it and having an education hub and hands-on learning. It was so exciting! I thought, ‘I don’t have to go over the Verrazano Bridge to teach my kids. And they will get to really experience that we are an island surrounded by water.’ It seemed like a big thing.” She joined the Living Breakwaters Citizen Advisory Commission in the spring of 2014. Amoroso understands the reservations of some folks whose properties abut the planned shoreline pathways or are in line of site of the breakwaters to be constructed as part of the Living Breakwaters. But she hopes her neighbors can rise above their negativity. Another reason to support the project is a much more pragmatic one, she notes. “I don’t know how it is escaping people that their flood insurance rates might go down for all this.” Although she lives near the Tottenville shore in an area that is 50 feet above sea level she says many others at lower elevations are paying astronomical rates for insurance. Some can no longer even obtain it.